Providing Quality Large & Small Quantity Promo Marketing Items since 1995. Order Custom imprinted flexible Telescoping Flashlights – perfect for shining bright LED light in hard to see spaces. These great mechanics tools include a magnetic base and can retrieve up to 3 lbs. 22inches fully extended – 4-LR44 batteries included. Comes in Black or Blue. A great household product and one of our most popular automotive service promotionals. 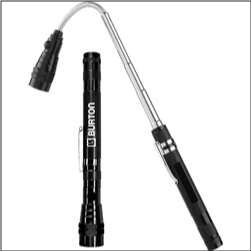 Anyone that likes tools will love this flexible telescoping flashlight – imagine your logo on it!